[PDF] Mediterranean Diet Salad Recipes: 30 Healthy & Delicious Salad Recipes You Can Easily Make For Breakfast, Lunch or Dinner That Will Help You Lose Weight, ... (The Essential Kitchen Series Book 37) | Free eBooks Download - EBOOKEE! Description: Exotic, colorful, and with enough zip to add something extra to any meal, these salads may prove to be the highlight of your day. You may well ask, â€˜what is a Mediterranean Diet Salad?â€ â€“ youâ€™ll discover the answer in the first few pages of this remarkable cookbook. The EKS Mediterranean Diet should be an integral part of any kitchen, especially if youâ€™re watching calories but want to maintain taste satisfaction. Deciding to make a difference in your overall diet, and determining to lose weight, need not consist of protein shakes, blah salads, and nothing else. Learn to prepare tasty salads with the natural ingredients contained in these recipes, and start a trend to improve your health. Easy to Prepare Salads If you're one of the millions of people who guzzle a cup of coffee for breakfast, and grab a muffin for lunch, youâ€™re cutting yourself short.You can eat healthy, nutritional, delicious meals every day, with a bit of planning and time. Believe meâ€¦itâ€™s worth the sacrifice. The easy to master recipes contained in the Mediterranean Diet Salad Recipes cookbook are perfect for home or brown-bagging it at the office. Before you know it, your co-workers will be asking for bites and tips on cooking. Remember where you got this book and pass it on. 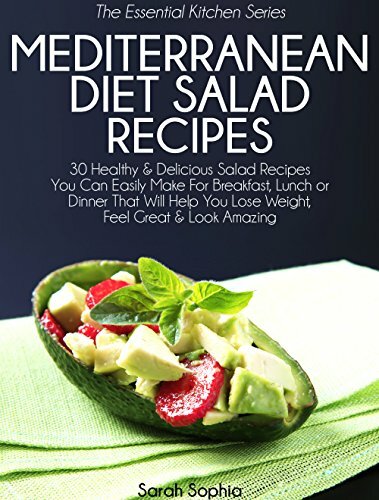 No comments for "[PDF] Mediterranean Diet Salad Recipes: 30 Healthy & Delicious Salad Recipes You Can Easily Make For Breakfast, Lunch or Dinner That Will Help You Lose Weight, ... (The Essential Kitchen Series Book 37)".